Henri Schongut, who took part in the Islands Odyssey 2015 and the Atlantic Odyssey II 2016 aboard Serendip, reflects on his 6,000-nautical mile Atlantic tour. An action-packed year rich in events, disappointments but also in joys, encounters, experiences that made it both moving and unforgettable. 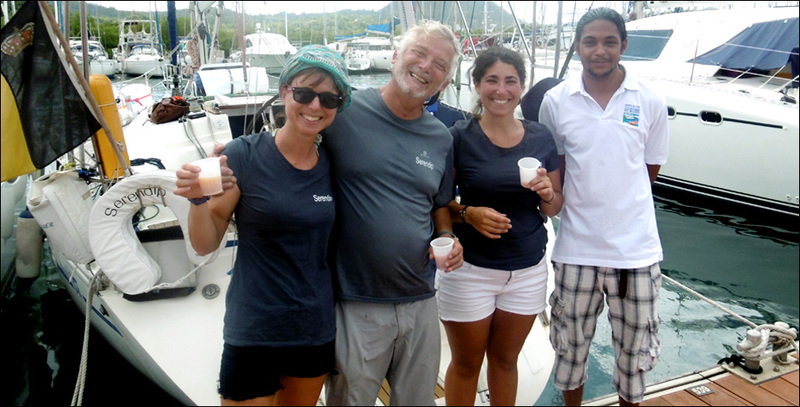 SERENDIP with her captain Henri, and two crew members Pauline and Clarisse. And then there are all my friends from the Islands Odyssey and the Atlantic Odyssey II. A transat is not necessarily a solitary act but more like (at least in my opinion) a human experience shared between diverse crew members that share the same boat. More than an introspective event, it consists of a unique experience of interpersonal relations. Cornell Sailing Events rallies are also not much like organised tours. The organisers arrive with a great deal of experience, and at the same time as leaving participants quite free, they organise very interesting activities. – And also social events which take place in Yacht Clubs, small restaurants or informal drinks between participants. The welcome which followed our arrival in Martinique brought tears to my eyes, as emotions were so strong and I knew that my Odyssey friends were truly sincere in their pleasure to see us again. This is because from the very start, the participants and the organisers became our friends. I have kept from these two rallies true friends and shared experiences. Amongst our group were so many interesting people with fascinating motives as to why they had decided to try the adventure… perhaps some of them were running away from something. But as all were looking to move their life up into a higher gear, this in itself made them interesting. I especially would like to mention the Cornell Sailing Events team. Pascal and Pascale [Guiraudou] who provided such a great personal support in difficult moments. And Jimmy Cornell, priceless navigator who is probably the one man in the world most knowledgeable about ocean cruising, a living encyclopedia, but more than that, a man of communication, knowing how to explain and transmit his concept of sailing voyages. I have attempted to remember all his remarks and recommendations, but if I had to choose one, I would pick his reaction, when we came to see him, worried about the departure from Gran Canaria which was to be made on a Saturday when strong winds were predicted. Should we leave? His response was classic: ‘I ask myself what sort of people you are who worry on Wednesday about what the weather will be on Saturday… we will see.’ At the moment he said those words, I was taken aback. Today, having several thousand nautical miles in my wake, I start to understand them. Thanks Jimmy for that great lesson of humility and positivity… not everything is controllable… and it’s happier that way!